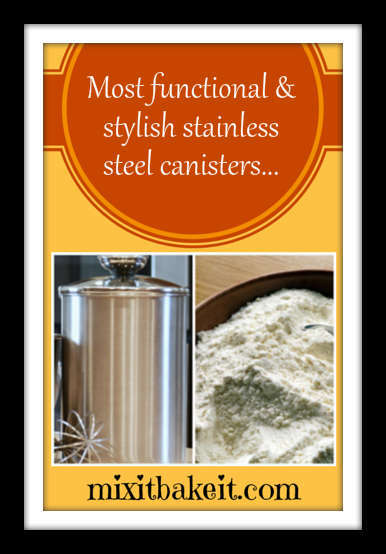 Functional, practical and classy stainless steel canister sets. Use them to keep your coffee, sugar, cookies and flour fresh whilst adding style to your kitchen. They are great for storing a variety of kitchen items like flour, coffee, sugar, pasta and snacks. Most have airtight seals. They are also wonderful wedding or house warming presents. I actually got the idea when my cousin received a beautiful copper-colored set on her wedding day. There are a variety of designs and styles you can choose from that’ll match your kitchen design, appliances, tools and cutlery. A window design on a steel and glass canister lets you identify what’s in and determine when to refill without having to open it. It’s practical and makes the canisters prettier. These 4-piece glass sets from Anchor Hocking have stainless steel outer sleeves with windows. They are tall and narrow which saves some counter space. You can store flour, sugar, coffee, rice or beans in them. They are small if you bake daily, but for a family of four, they’re enough. The tallest canister is perfect for spaghetti. The smallest is too small you can just use it to hold tea bags or artificial sweeteners. The canisters have screw top lids. They are not airtight but they seal well enough to keep contents fresh. The metal sleeve is glued to the glass but water can get trapped in between, but it eventually dries off. Canister Sizes: 64 oz., 46 oz., 36 oz. and 24 oz. The brushed finished of this set goes well with any kitchen. Colored cereals and candies will look beautiful in it. If you want to give a pop of color to your kitchen, this attractive cherry red sleeved canister set is a perfect decorative storage. It’s certain to catch the eye, especially if you have an all-white or bare stainless steel kitchen. Red is perfect! This all-stainless steel storage set has clear lids that let you see contents without opening them. The set includes one each of 27 oz., 38 oz., 47 oz. and 63 oz. canisters. If you use a lot of ingredients like flour and sugar, you may have to refill more often because they are not for large quantities. But they are great for lesser volumes. A strong latch clamps down the cover which has a removable plastic seal. This type of seal can fall off. You can dampen it with water to make it stick temporarily. If it falls off again dampen it again. This stainless steel canister set with scoop is top quality, durable, functional and classy. It is perfect for coffee, tea, sugar and flour. Matte stainless steel with mirror finish gives this a classy and elegant appeal. It looks great on a granite counter top. High quality tempered glass covers that is heat and shatter resistant are rimmed with durable stainless steel. Matching stainless steel knobs top the lids. Silicone gaskets provide an airtight seal. The set includes 0.85, 1.22, 1.56 and 2 quarts canisters. The tallest stands 8.75 inches with the lid on. The covers seal very tightly to keep bugs and humidity off. However, they are so tight they are not easy to remove. Also included is a stainless steel scoop with an easy-grip short handle so it doesn’t stick out when the canisters are nearly full. It would’ve been better if it includes four separate scoops. This is a hand hammered stainless steel storage set with attractive copper clad lids an accent. Each piece is lacquered to prevent tarnishing, however, it’s not entirely tarnish-proof forever. Canister sizes range from 20 oz. – 104 oz. The largest is a nice size for cookies or it can hold smaller bags of flour or sugar. Copper is timeless and these canisters will look great in both old world and modern kitchens. The hammered look enhances their decorative appeal. The covers fit snugly. Some users say they are not airtight, while others say they are. This set of 6 spice jars is made with sturdy stainless steel bodies and clear glass covers. Handy and solidly crafted, it also features magnetic bottoms and includes a countertop holder. The pieces attaches easily on refrigerator doors and other metal surfaces. Airtight lids have shaker tops with sift or pour settings. This silver onyx set has a lovely mirror finish. It’s a nice, high quality storage set with fine workmanship. The look is modern and sleek. You can choose from two sizes: 32 oz. and 64 oz. Available in sets of 2 to 4 pieces or you may opt for just one piece. The opening is wide enough to easily get a measuring cup in, yet they don’t take a lot of storage space. Airtight hinged clamp glass lids protect food from air and humidity. They seal tightly it may take a bit of effort to get them off. Don’t carry a canister by the handle on the lid, you might end up scooping cupfuls of flour or sugar from the floor or counter. To clean, hand wash with soap and water. This storage set includes a 100% money-back guarantee. Functional kitchen canisters are perfect for adding newness into any kitchen. An outdated one can easily be made fresh with stainless steel containers. It is versatile and matches well with any theme, color and design. It takes very little effort to change the look of a counter top, a display cabinet or a nook with these attractive kitchen accessory. Choose something that is both useful and eye-catching.